The lacquer is an easy to do, but slow, it takes time and a little practice. Before varnishing a guitar, furniture or other instrument, it would be interesting to experiment with a small piece of furniture or just any table. It may take three or four weeks. Upon completion you should spend a week to dry properly. This type of coating has advantages over other synthetic because if a small stroke can be restored again with a crankpin and some hairspray. 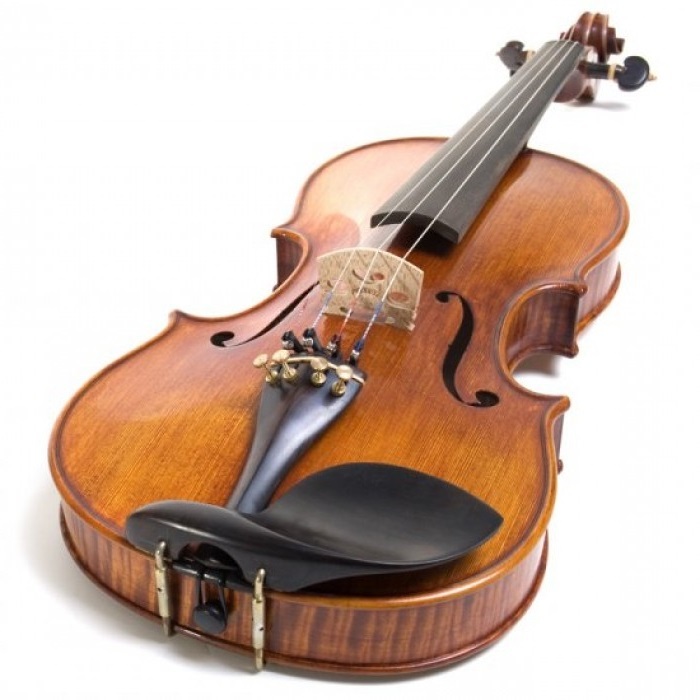 In addition, the most important is that being a very thin layer, does not remove the sound of the instrument. The layers of synthetic varnishes are much thicker and difficult repairs. Still good classical guitars and violins are painted with this system. Shellac is a natural product produced by an insect called “coccus lacquer”. • 200 gr of shellac. (There are several types. 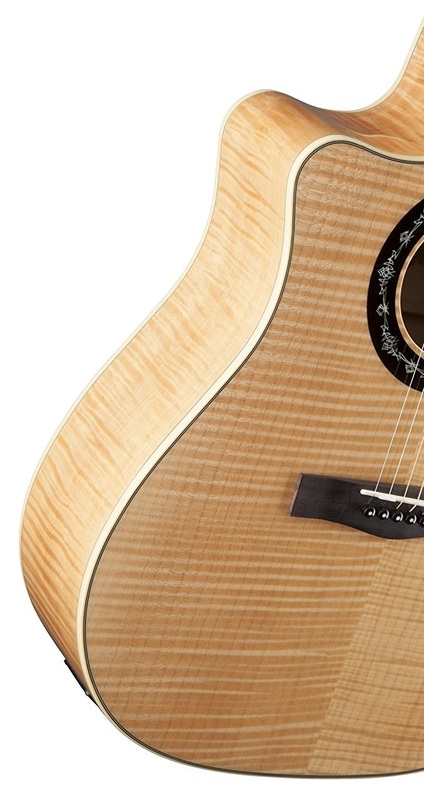 Some come Dewaxed quality, are ideal for the soundboard to not darken the wood). para la tapa armónica para que no oscurezca la madera. • 1 package of cotton or wadding to the crankpin. • 1 Small bottle liquid petroleum jelly. • 100 gr of White of Spain. • 4 empty glass jars with tight-fitting lid jam. • 4 empty plastic cans for dispensing the preparation of shellac. • 1 small sable brush hair for use in areas where there is no crankpin. 1. bottle ¾ liter of methyl alcohol added 1/3 volume bottle shellac introducing through a small funnel. If the bottle is full remove some alcohol. Leave about 12 hours to dissolve and move the bottle occasionally. 2. Prepare a little pumice pouring in a small handkerchief in the same fabric that we will use to make the crankpins. We closed with a rubber band or string and have it ready for use. It will serve to screen the pumice stone and apply it. 3. Make another equal to the target of Spain. 4. To make a crankpin a piece of cotton (about the size of a strawberry) is caught. Wrap it with a piece of cotton fabric or old plush. It is smooth and without folds. Secure it with a small rubber band. Make three crankpins. When not in use, enter them in the previously labeled so they do not dry airtight jars. If they get hard over time make new ones. 5. Prepare the instrument properly, leaving it perfectly sanding, using different grain sandpaper down to end lower grain sandpaper. 6. It should be operating in a ventilated place with low humidity. Ideally humidity between 40 and 50%. 7. Label a glass jar to hold the pin that apply shellac. 8. Label another jar for another crankpin to extend pumice with alcohol. 9. Label another jar for another crankpin to extend the target of Spain. 1. With hot water and wetting a crankpin or brush to give a hand to the entire instrument to come out all the dust and the pores open. After an hour or two. a very soft sandpaper is passed across the surface. According to wood will be seen is whether to repeat the process. 2. If you will give to wood stain, do it before the next step. 3. Give a hand of liquid petrolatum with a crankpin. Let dry for 12 hours. 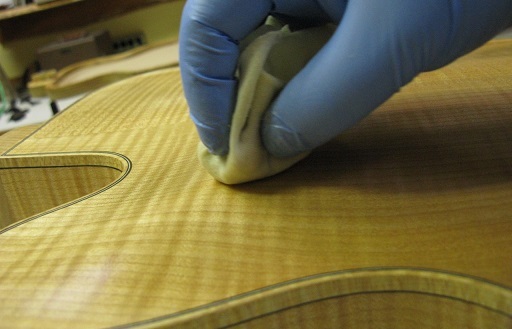 Some luthiers use beaten egg white for use as primer instead of petrolatum. If flaxseed oil is used as a primer must take into account that darkens the wood. 4. After lightly pass a very fine sandpaper started to shellac to the soundboard in circular movements across the surface. Every two or three passes, add a few drops of vaseline oil to the crank pin to slide it well. Work for an hour in past and turning continuous. Let dry for 12 hours. Save the crankpins in airtight glass jars so they do not dry out. 5. Dropping the bag of pumice on the surface of the lid to implement the pumice. Then with another crankpin + shellac keep rubbing in circles for the pores they are completely sealed. Wait for it to dry 12 hours. If spurts appear in the varnish to dry and continue after 12 hours. If you do not get with the crankpin, sanding to level. 6. Every two or three coats of shellac, once dry, pass a finer grit sandpaper. 8. Pass the sanding lightly with one or two drops of vaseline oil. 9. Sanding and continue giving hands shellac entire surface. They will see the results. Let dry for 12 hours. Never make two passes over the same place. If not dry shellac, the alcohol rises again and also sticks to the crankpin. When not slide well crankpin add one or two drops of oil. 10. When a good finish is achieved, is passed to the final process. 2. Put wood on a white flecks of Spain in 2 or 3 places and a few drops of Vaseline. 3. Spread a new crankpin with ethyl alcohol and extend over the entire surface three components rubbing in circles and see how it will be taking a crystal shine. Let dry and repeat the process until you get a good finish. 4. Finish with past in the direction of the strands of wood.